Game Day Chili - hamburger, onions, garlic, chili beans, tomato sauce, green chiles, beer, beef broth, tomato past, chili powder, Worcestershire sauce, cumin, red pepper, paprika and hot sauce. Simmer on the stove or make in the slow cooker. The is THE BEST chili! It has a kick! Top with sour cream, cheese, Fritos and jalapeños. This is the best chili I've ever made. It was fantastic. I had some concerns because it is made with a bottle of beer, but we couldn't taste it in the final product. This chili does have a kick to it. You can easily adjust the heat by reducing or eliminating the red pepper and hot sauce. We topped the chili with some cheese, sour cream, jalapeños and Fritos. It was a real crowd pleaser! Everyone loved it. I browned the meat and mixed up the chili the night before. I let the chili simmer on the stove before the game. This recipe would also do great in the crock pot. This chili perfect for chilly weather games! Brown meat in a Dutch oven over medium heat, stirring until meat crumbles and is no longer pink. Drain well. Return meat to Dutch oven. Add garlic and onion flakes. Cook 30 seconds. Add remaining ingredients. Bring to a boil. Reduce heat and simmer 3 hours, or until thickened. Garnish with sour cream, cheese, jalapeños and Fritos - if desired. Can also make in the slow cooker. Cook meat and put in slow cooker. Add remaining ingredients to slow cooker, stir. Cook on LOW for 6 hours. I see you spoil your kitties like we do. Yes, our kitties are on the counters and my dad shares his meal with them. I love your tablecloth! 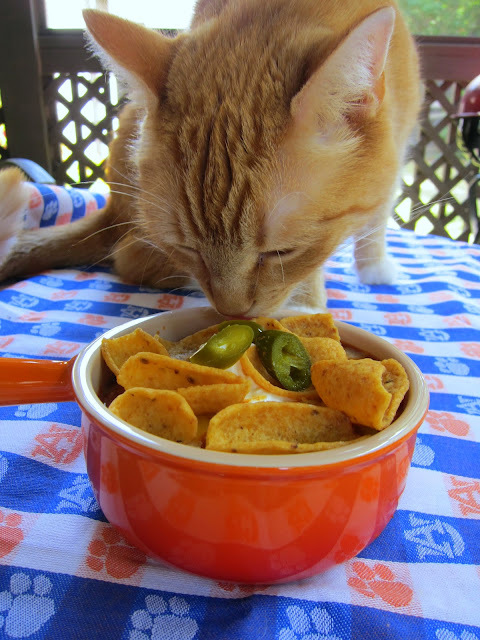 And the orange chili bowl is cute too! War Eagle! My Putter thinks she owns my dinner plate! Love that picture of Jack checking things out! Looks great. This is similar to my chilli recipe. I always put a bottle of beer in - I think the sugar in the beer brings out the flavour of the tomatoes. I usually add chopped peppers (pimentos) too. This is one of those recipes that is always better the next day! we almost always add a beer to our chili. You're right, it adds flavor to the chili but doesn't taste like beer. Good stuff! I also added a can of french onion soup. Eating it right now for the Wisconsin/Ohio State game! Made this chili yesterday. The family raved about it. It was delicious with a unique flavor. I hadn't used Rotel or beer in chili before but has been pronounced our favorite. Out with the old recipe, in with the new. Thanks! Jiggity Jig - I felt the same way about the chili. So glad you liked it too! I would like to make this in the crockpot, what are your suggestions for timing? I would love to make this in the slow cooker, as i dont have a dutch oven. What are your suggestions for cooking times and temps? I made this two days ago.I had a small can (8 oz) red chili sauce, so I threw that in, too. Very good!